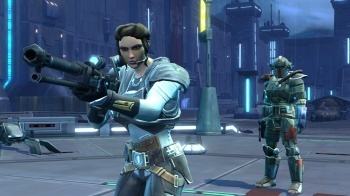 The publisher thinks that The Old Republic could have viral appeal if the launch is handled right. When it comes to MMOs, it doesn't really get much bigger than World of Warcraft. Knowing this, EA has studied the first year following WoW's launch, to see if it can pick up any pointers it can use when Star Wars: The Old Republic comes out. "We've actually studied WoW pretty carefully," said Eric Brown, EA's chief financial officer. "We spent a lot of time studying the first twelve months or so of WoW, and just to be clear here, when they initially launched, they did not launch in dual geographies. They went North America only." Brown also reiterated the point that EA was deliberately keeping the initial numbers low in order to keep the launch as smooth as possible, something he thought would pay dividends in the future. "In the short term, we would [opt] for a higher level quality of service versus a sheer numerical count of subscribers, because we're quite confident that, with a great game experience at launch, we'll get this viral effect," he said, adding that he hoped that The Old Republic would attract entire groups from other MMOs. Brown said that EA had also studied WoW's post-launch strategy, and how it handled content updates. He said that BioWare had put in place a plan to make sure that content came out in regular intervals, and that while it was inevitable that there would still be people who blazed through the game's content, most players would not be lacking in things to do.